You can adjust the row and column sizes in a Microsoft Excel spreadsheet to create space between columns or rows of text. That feature is handy because by default, each column and row in an Excel spreadsheet is the same width. 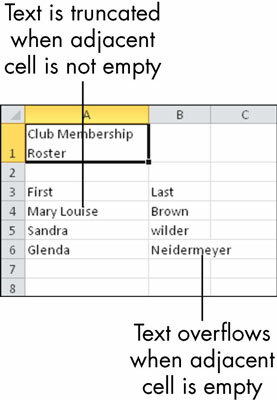 If the cell to the right is blank: The text overflows into it. If the cell to the right isn’t blank: The text appears cut off (truncated). The full text is still stored there, though. To widen the column exactly enough to hold the longest entry in it: Double-click the divider between the column headers or choose Home→Cells→Format→AutoFit Column Width. To widen the column manually: Drag the divider between the column headers. You can also make a column narrower; just drag to the left, rather than to the right. This process also works with row heights. 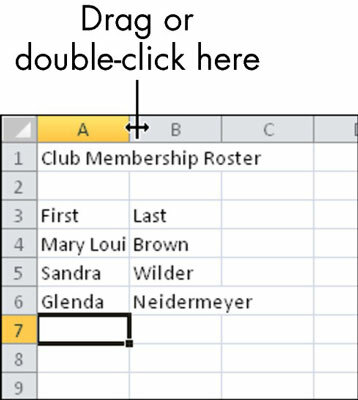 You can drag the divider between two row numbers to change the row height or double-click the divider to autofit to the content. Row heights adjust automatically to fit the tallest text in them, so you don’t have to worry about text being vertically truncated in rows — usually. If you manually adjust the height of a row and then put some larger text into it, the larger text may become truncated because the row height has been fixed. To make it autofit again, choose Home→Cells→Format→AutoFit Row Height.